This garden water hose cart has all the innovative features of the "Metal Gemini". Constructed entirely out of metal and finished with an epoxy resin coating, the cart is fully resistant to the Great British weather. Large size wheels covered in rubber take the load of this cart, and make handling easy. 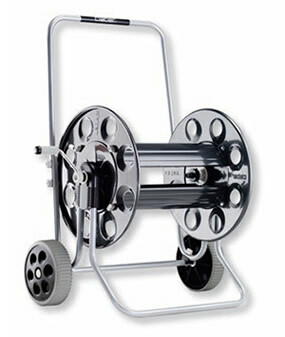 With a true capacity of 165m of 1/2" hose, this truly is a great professional hose cart.